photo-eye Gallery is pleased to host a book signing and talk with photographer John Cohen for his new photography book The High & Lonesome Sound and the booklet of photographs that accompanies the multi-media box set Pull My Daisy, both released by German art book publisher Steidl. The High & Lonesome Sound explores the music, life and legacy of musician Roscoe Holcomb. John Cohen met Holcomb in Eastern Kentucky while Holcomb was playing the banjo on his front porch. This was the beginning of a life-long friendship that provides the backdrop of The High & Lonesome Sound. Holcomb's music is described as a "mixture of blues, ballads and Baptist hymns" sung through his strained, high voice. Over the course of thirty years, Cohen visited Holcomb to photograph him and record his music. The book contains a DVD with two films about the musician as well as a CD. Pull My Daisy multi-media set surrounding Robert Frank’s famous1959 film focusing on the Beat Generation and starring Allen Ginsberg, Gregory Corso, Larry Rivers, Peter Orlovsky, David Amram, Richard Bellamy, Alice Neel, Sally Gross and Pablo, Frank’s then infant son. 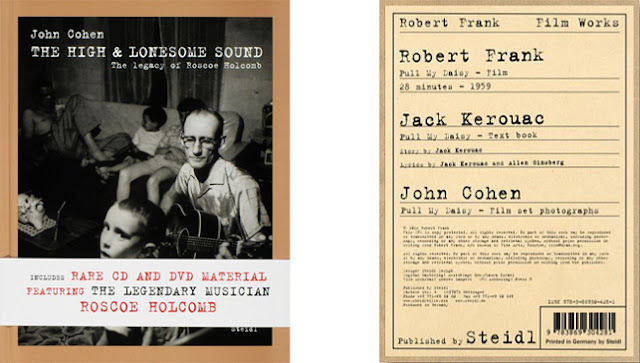 Legendary musician and photographer John Cohen was a contemporary of these great voices and this newly released set contains the film Pull My Daisy on DVD, a text book by Jack Kerouac and film set photographs by Cohen. John Cohen is an artist, filmmaker, lecturer, writer, as well as member of The New Lost City Ramblers and a preservationist of fading musical genres. He received his MFA from Yale School of Fine Arts in 1957. His work has appeared in numerous publications including There is No Eye and Past Present Peru. His works has been exhibited at Whitney Museum of American Art, National Portrait Gallery, Nacional Museo de Arte, Lima, Peru and many other venues, and are in the collections of Metropolitan Museum of Art, Brooklyn Museum, Museum of Modern Art, Victoria & Albert Museum, London and many other venerable institutions.